Bart DeLorenzo directs the acclaimed off-Broadway hit play by Nicky Silver. Celebrated actress Audrey Langham reaches her breaking point while rehearsing Medea in Chicago � walking off the stage, out of the production and into her married daughter�s summer house in Cape Cod, where her unexpected and unwelcome arrival sets off a chain of events alternately hilarious and harrowing. �Critic�s Pick� An unconditional treat� Mr. Silver is a dramatist with an original and thoroughly sustained tragicomic worldview.� � Ben Brantley, The New York Times. "...Silver knows his way around a one-liner, and he sets up some delightfully silly situations. However, the unfolding disaster is so predictable that it lacks emotional impact, and the characters verge on stereotype." "...Director Bart DeLorenzo expertly calibrates the changing emotional tones that give the play its resonance and impact. I am less taken with Mr. DeLorenzo's staging on scenic designer Alex M. Calle's lovely but static set. The giant deck of Kitty and Dennis's Cape Cod rental dominates the stage, leaving little room for the scenes that take place elsewhere on the beach, and forcing the actors to make awkward entrances and exits extreme upstage left and right. I would like to feel a sense of the physical expansiveness the characters feel." "...Alex M. Calle's scenic design fills the bill, with Michael Mullen's costumes adding just the right note to the proceedings. Rose Malone's lighting and Christopher Moscatiello's sound keep the play moving along, and the entire production team does a memorable job. 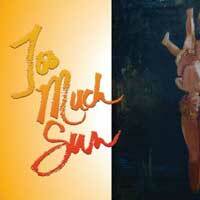 TOO MUCH SUN is well written, beautifully acted, and has just the right amount of pain and pleasure, laughs and tears. There is also the dark wit which has characterized Nicky Silver's plays over the years." "...Tony-nominated playwright Nicky Silver goes Chekhovian without abandoning his gift for snappy one-liners in Too Much Sun, a West Coast Premiere that manages to transition from comedy to something befitting the Greeks without missing a beat." "...This play has substance, humor and heart. Playwright Silver, who now resides in London, is a master of creating people with whom you can empathize as we get to know them well, warts and all. Each of his characters are given the opportunity to reveal their personality with lines and actions that grab and hold our interest. You leave the theatre as you would at the end of a great repast.Well sated and anxious to share all the delights with your friends." "...In Too Much Sun, author Silver flits between light and dark, humor and tragedy, in Joe Orton fashion. His group portrait of people struggling to overcome their hang-ups and find a way to remake themselves is a touching one. But above all, it is the bigger-than-life Audrey who makes this play work as well as it does." "...Talented director Bart DeLorenzo has polished the performances and clarified the action. But he is unable to camouflage the play's problems. Audiences with a good memory may find themselves thinking of DeLorenzo's exemplary work a couple of seasons ago in the same theater, on a play with a comparable theatrical background and an amazingly similar set, but a far better script by David Greenspan." "...In general, the piece alternates between serious and comedic sequences with little stylistic coherence, while the "transformative" ending feels phony, unearned. But it would be wrong to leave out that the opening night audience seemed entertained, and most audiences will probably find a great deal to be amused by in this minor effort by a strong, often elegant writer." "...The cast, under the sure hand of director Bart DeLorenzo, individually and as an ensemble, creates vivid, unique characters of considerable subtlety and intensity, easily standing up to the thousand-watt star power of Ms. Cary." "...No metter whom you come the Odyssey Theatre with, I'll bet you leave with questions." "...Too Much Sun by Playwright Nicky Silver, presently a guest production at the Odyssey Theatre, is a clever and witty work whose cleverness and wit is severely hamstrung by the looseness of its own first act." "...Outsized histrionic characters are this playwright�s stock in trade. He is often grouped alongside Joe Orton and Christopher Durang, with perhaps a glance back to Oscar Wilde, and I would add the current writer Rajiv Joseph, for the darkly absurd situations into which he sets his problematic characters. He assures that the audience will have plenty to laugh about, but part of that comes from the exaggerated high drama, which feels real enough to make these characters believable." "...Silver is a rare farceur whose work is always welcome. This time around, Silver's characters are under a titular spell, addled by the heat and showing little ability to sustainably overcome a pervasive sense of apathy and exhaustion. TOO MUCH SUN is a transitional work for its author, his last "New York play" before moving to London last year."